Meticulously researched by a senior private banker now turned historian, No More Champagne reveals for the first time the full extent of the iconic British war leader's private struggle to maintain a way of life instilled by his upbringing and expected of his public position. 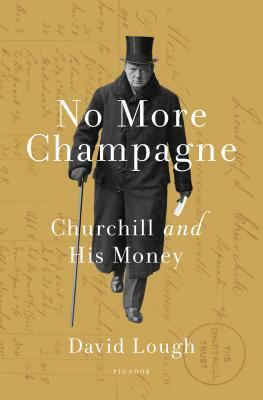 Lough uses Churchill's own most private records, many never researched before, to chronicle his family's chronic shortage of money, his own extravagance, and his recurring losses from gambling or trading in shares and currencies. Churchill tried to keep himself afloat by borrowing to the hilt, putting off bills, and writing "all over the place"; when all else failed, he had to ask family or friends to come to the rescue. Yet within five years of the war, he had taken advantage of his worldwide celebrity to transform his private fortunes with the same ruthlessness as he waged war, reaching 1945 with today's equivalent of £3 million in the bank. His lucrative war memoirs were still to come. Throughout the story, Lough highlights the threads of risk, energy, persuasion, and sheer willpower to survive that link Churchill's private and public lives. He shows how constant money pressures often tempted him to short-circuit the ethical standards expected of public figures in his day before usually pulling back to put duty first-except where the taxman was involved. David Lough studied history at Oxford under Richard Cobb and Theodore Zeldin. After a career in financial markets, he founded a business that advises families on looking after their investments, tax affairs and estates. No More Champagne is his first book.